Congratulations to Chris on his first European Tour win. 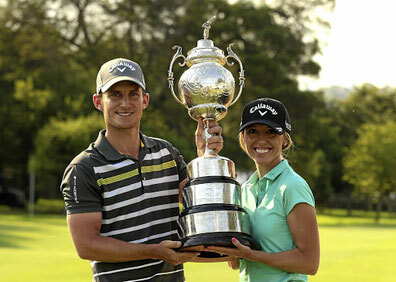 Stocksfield’s Chris Paisley (with the help of his wife Keri as caddie) claimed the first European Tour win of his career at the South African Open in Johannesburg. Starting with a 66 on day one Chris was just one behind the leader then after a 65 on Day 2 followed by a 70 on Saturday he was in the lead, just one shot ahead ofworld number 30 Branden Grace. Then, despite the pressure applied by Grace's fast start Chris had six birdies in a six-under final round of 66 to finish three shots clear of the South African. I just wanted to say thank you for the wonderful messages of congratulations. It meant so much to me and Keri. Last week was incredible and I will never forget it. To think that the journey started at Stocksfield all those years ago blows my mind. Thank you to everyone involved at the club who have been part of it. I hope I made you all as proud of me as I am to be a product of Stocksfield Golf Club.